It's Maternal Mental Health Awareness Month and I'm excited to be speaking locally here in San Diego about this important topic. 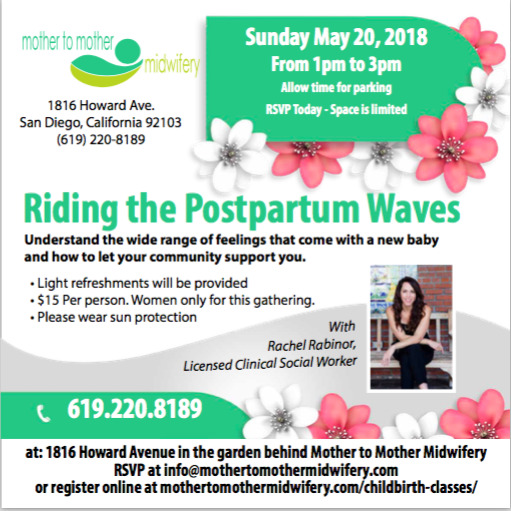 Please join me on Sunday, May 20th from 1 - 3pm at Mother to Mother Midwifery in University Heights for an interactive workshop on planning for the postpartum period. You'll learn more about the common range of emotions expecting and new mothers may experience, and how to get the support you need throughout this transition. You'll also leave with a personalized visual map for staying connected with others and building a community that supports you through this time. We know that 1 in 5 women experience a perinatal mood or anxiety disorder (PMAD) while pregnant or postpartum and that this isn't just part of the normal adjustment to motherhood. If you're not quite you and you're brushing it under the rug, please join us next Sunday to learn more. If you need help immediately or can't make it next Sunday, the Postpartum Health Alliance in San Diego and Postpartum Support International are great resources for finding therapists and support groups near you. Becoming a mother is the biggest transition a woman goes through in her adult life. We’re taught to think and plan for the birth: Will I have an epidural? Pitocin? Vitamin k? I’ll bring music, wear an eye mask… There’s such a huge range of considerations. But what about after the birth? We anticipate happiness, love, deep connection with our partner and an instant bond with our baby. How will we foster these emotions and experiences? Will they just happen? And what else might I expect? Read more on Mother to Mother Midwifery's website.